Transparency Market Research (TMR) has published a new report titled, “Pressure Ulcers Treatment Market - Global Industry Analysis, Size, Share, Growth, Trends, and Forecast, 2018–2026”. 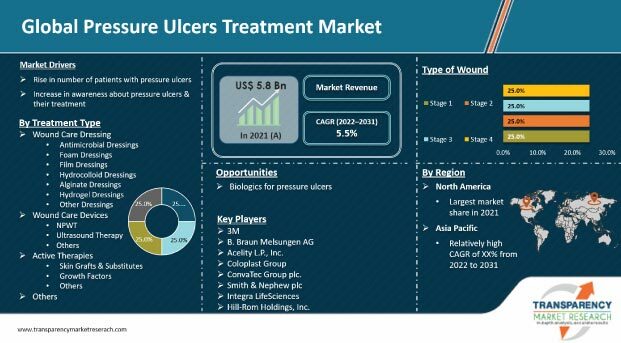 According to the report, the global pressure ulcers treatment market was valued at US$ 4,000 Mn in 2017 and is projected to expand at a CAGR of 5% from 2018 to 2026. Increase in the number of patients with pressure ulcers and rise in adoption of artificial skin substitutes are anticipated to boost the growth of the global market from 2018 to 2026. North America and Europe are expected to dominate the global pressure ulcers treatment market in the next few years, owing to new product launches, demand for technologically advanced wound care management in developed countries, and proactive population seeking physician advice at early stage of pressure ulcer. Key players in the global pressure ulcers treatment market strive to enter into distribution agreements to strengthen their footprints across the world. The report offers detailed segmentation of the global pressure ulcers treatment market. Based on treatment type, the active therapies segment is likely to expand at the highest growth rate during the forecast period, as biosynthetic skin substitutes offer effective solutions for pressure ulcers of all age groups. Technologically advanced products such as hemostatic agents and fibrin sealants for pressure ulcers treatment are also effective solutions. The wound care dressings segment is likely to expand at a high CAGR during the forecast period, owing to increase in the usage of antimicrobial dressings for pressure ulcer treatment. Antimicrobial dressings not only offer high efficacy in treatment of pressure ulcers, but also reduce the treatment cost. The wound care dressings segment has been classified into negative pressure wound therapy, ultrasound therapy, and other therapies. The other therapies segment include innovative technologies such as hyperbaric oxygen therapy (HBOT) and electromagnetic therapy. The negative pressure wound therapy segment is estimated to witness a stable growth during the forecast period. The other therapies segment is anticipated to expand at a higher CAGR during the forecast period. In terms of type of wound, the global pressure ulcers treatment market has been categorized into stage 1, stage 2, stage 3, and stage 4. The stage 2 segment held the dominant market share in 2017. The segment is anticipated to expand at a significant growth rate during the forecast period. Dominance of the stage 2 segment is due to higher incidence of stage 2 pressure ulcer than other stages. In terms of end-user, the global pressure ulcers treatment market has been divided into hospital inpatient settings, hospital outpatient setting, community health centers, and home health care. The hospital inpatient settings segment held the largest market share in 2017, as treatment of pressure ulcers is mostly conducted in hospital inpatient settings. In terms of revenue, North America dominated the global pressure ulcers treatment market in 2017. The market in Asia Pacific is anticipated to expand at a rapid pace during the forecast period. Growth of the pressure ulcer treatment market in the region is attributed to increase in geriatric population and rise in the number of patients suffering from chronic diseases. Additionally, increase in adoption of advanced wound care management products among health care professionals and favorable government reimbursement policies contribute to the growth of the pressure ulcer treatment market in Asia Pacific. The report also provides profiles of leading players operating in the global pressure ulcers treatment market. Smith & Nephew plc, Integra LifeSciences Corporation, Acelity L.P., Inc., and ConvaTec, Inc. are the major players in the market, offering products with proprietary technologies. Other players include Hill-Rom Holdings, Inc., Mölnlycke Health Care AB, Essity Aktiebolag, Cardinal Health, 3M Healthcare, and B. Braun Melsungen AG.